Fill your closet with patterns and colors and you'll be surprised to find that they all still kinda match if you want them to. C'est à la mode, des motifs qui ne sont pas compatibles. When I got to Paris, my host mom took one look at my blindingly-bright pink sundress in my closet and said, "Parisians don't wear this". Ouch. To be fair I wasn't expecting to wear it in Paris, more like on vacation, but I still feel the sting. I wear multiple colors here. All the time, everywhere. One day I wore an orange satin snakeskin midi skirt with a lime gingham wool sweater. If that isn't the epitome of clashing, I don't know what is. It sounds like the jungle juice of outfits, doesn't it? However, I actually really liked the way they looked together and got tons of compliments (I only say that to emphasize that it wasn't just me who liked the outfit). Too bad I walked over a vent on the sidewalk on one of the busiest streets in Saint-Germain Des Prés and had my very own Seven Year Itch moment. Sigh. Anyhow, yesterday I wore some of my favorite pants. 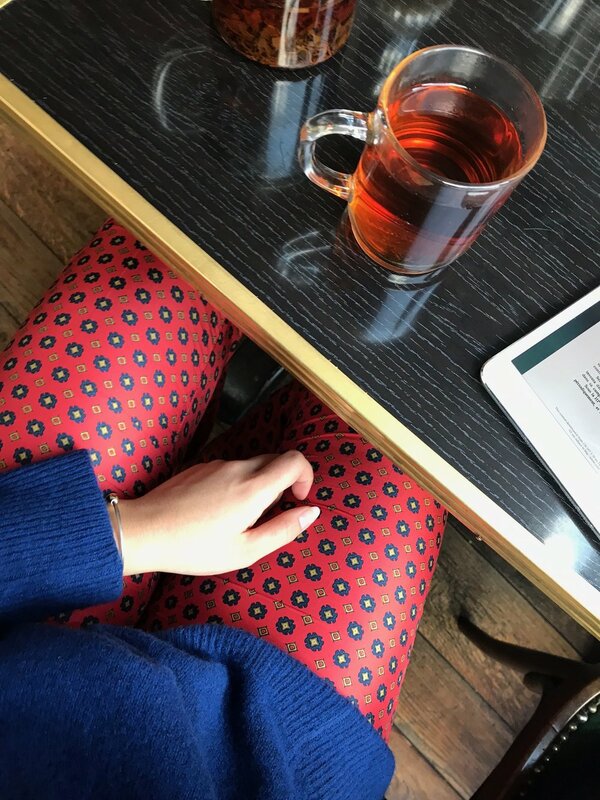 I've had these pants for years but never got around to wearing them...they're silk, and therefore extremely delicate, and I didn't know how to wear patterns, and actually most of the time I've owned them, they were too tight. Like, enough that I either couldn't breathe or doing anything other than standing would have split the seams. But now that I can actually fit into them (how? Unsolved mystery at the moment, the feds are looking into it) I wear them ALL. THE. TIME. With everything. Including my green and black coat. I don't know. But I also paired it with a classic, crisp white oversized blouse that has trumpet sleeves, rolled back to add an air of chill. The saleslady at the store showed this to me. But my favorite part of the outfit is actually the neck scarf. Un foulard gavroche avec un dessin de sangles, it's vintage. It has nearly every color on it, and is completely clashing with the pants but I love it even more for that. Have a look-see (you can't really see the scarf and I'm sorry for that). Also yeah the shirt is fairly large and of awkward length so gotta do that half-tuck. Love a good half-tuck. The other photos are just random clothing updates. I really haven't been good about OOTDs lately!! Neck scarf 2: Vintage ? So it's gotten cold and I have insufficient outerwear. I'm pretty sure I assumed my parents could send them to me, but lo and behold it's actually cheaper to just buy new ones! So for some reason I decided to buy an oversized white fluffy one and a metallic puffer jacket. I don't really know why I make these types of decisions but I do. This metallic jacket I actually wore on Halloween, as my impromptu costume was space cat. What's a space cat? I'm not sure. I had nyan cat in mind kind of, but I'm not sure what that is either, it's just funny. Rookie mistake though because after being completely submerged in cigarette smoke at those Slovakian bars, it took a solid three days for the coat to air out and smell normal again. I felt like I couldn't wear it without getting debilitatingly nauseous. So anyway, here are some pics of the coats and outfits of break. Let me know in the comments where you like to buy coats and what types you're wearing to fight the cold. I'm looking for a hearty wool coat or something but haven't had much luck finding the perfect one. This is the weather you can only dream of. Perfect. Leaves turning, on the Seine. And yet, for half of it I was cooped up studying for my French law midterm (why am I taking law in French? Good question!). Took me a solid hour to commute to this very dingy and nondescript exam building on Saturday out in the suburbs. Our test began as the sun was rising. So that's why I've been a bit MIA, as this is by far my most difficult class. Immediately thereafter I headed to KONG for brunch. If you're unfamiliar with it, it's a bougie rooftop restaurant with small plates and big prices. PS for the penny-pincher: Don't order cocktails. And also, the à-la-carte brunch is only on Sundays. KONG is about as bougie as it gets, I think. I had a flower floating in my drink and was surrounded by people taking Instagrams with the Pont Neuf and Seine view in the background. The waitresses looked like they were going to a club. And there is a dress code for the guests I believe. It's unclear, so I opted for a happy medium: My gold Soi Paris coordinating set with loafers that completely shredded my heels (but what's new?). I'm so in love with the Soi outfit. It was 75º so the perfect opportunity to wear this AMAZING skirt. Plus, the thing holding the tag to the skirt is a braided bracelet I believe. Double score! I'm really into two piece outfits/co-ords/ensembles. I see lots of Parisian women wearing a more fashion-forward version of a suit, such as with plaid crops and an oversized matching blazer. Super chic and I want one. After brunch, I split off from the group to go back and take a nap, but along the way I stopped at Officine Universelle Buly to pick up an oil and this small tea and chocolate shop on Rue de Rennes. I was wandering unfamiliar streets of the 6th, at a very slow pace, listening to the Killers and munching on a Rocher Praliné en chocolat noir. It was in this moment I thought to myself, I am living my best life. I walked past Soi on Rue de Rennes and smiled to myself. Anyhow, here are the pics. This is my cool Canadian friend. 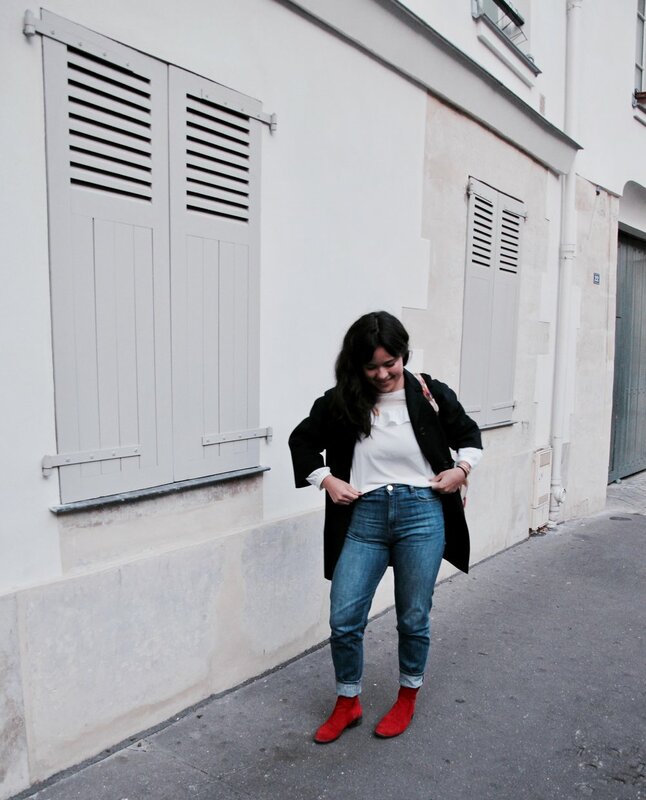 Sézane: My fave jeans! Parisian it-girl brand! So I'm pretty sure no one really likes jeans. Right? I mean, of course, they're pretty practical and can definitely be cute. But I've never been able to find a pair that properly fit me, and I suppose I still have not BUT, keep reading to learn about this Parisian brand that you may or may not have heard of that is ~ all the rage ~. So I don't really wear proper jeans. And by proper I mean just regular old blue jeans. For some reason I am only drawn to flairs, crops, whites with fringe...etc. But that is not the norm here, and I am finding more and more that a regular trusty blue pair could do me some good. I really like Hudson Jeans, Paige and J Brand. But I am totally freaked by packages here after I got fined like 100 Euros once, so I am determined to buy everything in stores. Anyway, after some in-depth research of local brands, I discovered it-girl brand Sézane, which I had no idea I had actually been seeing on my favorite bloggers. So anyhow, I made my way over to their Appartement, during fashion week, so naturally it was a madhouse. Also keep in mind that I am like super short and so these jeans could be made to fit taller girls. Unsure. You've heard it on here. You've seen it on here. I love culotte pants. Summer and fall staple. I brought my gingham pair, my pink pair, and a pair I bought in Italy of a lightweight cream color (which I'm obsessed with, by the way). They are perfect for Paris. They are comfortable enough to not be pants, widely-shaped enough to not be pants, and frankly they're just non-pants pants. What more could you want? Here's the issue with Parisian fashion (however, I use the word "issue" lightly). This is not a "dress how you want" type city. Which is all fine and well, I appreciate it, actually. BUT, in the way of technical issues, you just can't really wear dresses or skirts. There are breezes every now and then, especially in the metro, and when you're constantly walking and standing up and down it's just uncomfortable. If it's not a midi-situation, it's not worth it. That being said, I do see some Parisians wear tights under shorter skirts but even then, they're constantly tugging at them. There are cultural aspects too but I won't even dive into that. For these technical reasons alone I prefer to stick to various forms of pants. Which is why, culotte pants are a dream. Except these are the world's wrinkliest pants. Can you tell....? So my host mom doesn't have an iron, therefore I used my straightener to attempt to iron out this situation (hahahahahahahahahahahahha). Anyhow, didn't really work. But I love this look regardless. 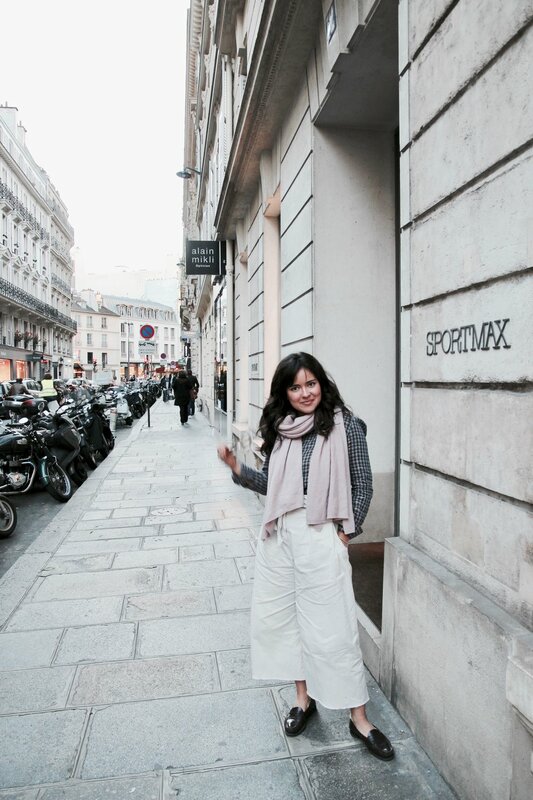 Cream colors are the perfect complement to Haussmanian buildings. Maybe this is why Parisians don't wear color...? This top I got from MKT Studio, a Parisian boutique I believe. I splurged on it one day after a particularly exciting event. I love the colors, and it gives me a perfect excuse to wear my silver and turquoise jewelry that I adore so much. 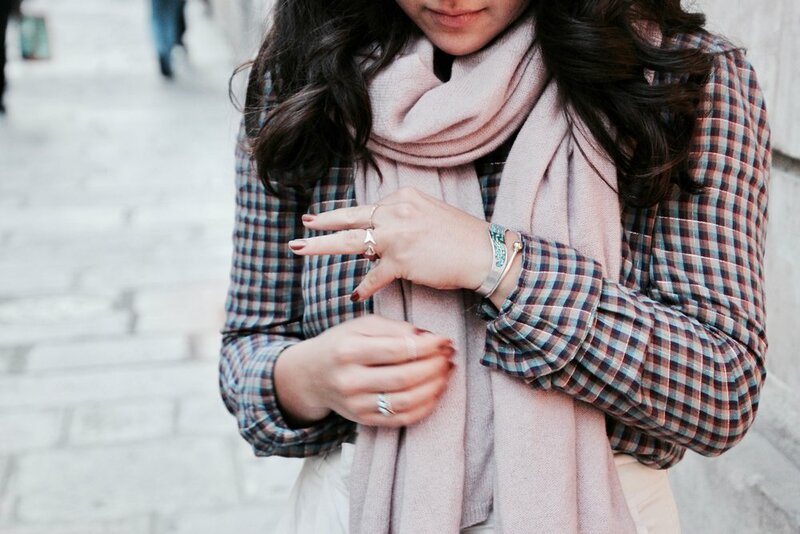 I paired it with my scarf that I also got in Italy because it's about 60 here, which is frankly the perfect temperature, but Parisians tend to freak out once it gets below 75. It's so strange because they move so much and no building has AC, and yet, once it hits 75 everyone starts wearing sweaters and jackets and it's very much psycho. So I'll just stick to my scarf, thanks.